in 1936, the Auto-Glide. The Model 53 Airborne was made famous during World War II as a scooter that could be air-dropped alongside paratroopers. In 1949, Cushman introduced its most popular model, the Eagle. This was a departure from the step-through scooter design to one that resembled a scaled-down traditional motorcycle, namely a Harley-Davidson Knucklehead or an Indian Chief. 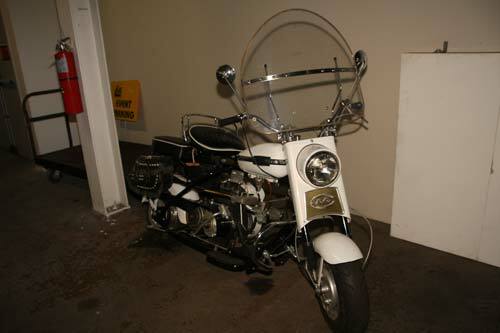 The Eagle was available with a number of accessories, from plastic windshields to dual split exhaust (as this was a single-cylinder engine, this was done purely for the enhanced exhaust note). The ultimate option of the day were fringed leather saddle bags, as seen here on our Eagle.